It’s been a DREAM of mine to release a long-form case study that takes place over 12 months, and I’m excited to present part 2! Please meet Tanya from Traveling Tanya! She’s a brand new blogger (at the time of this post), and we’re going to be following and picking apart her journey over the next year. This is part 1 of 4! Rather than craft an entire blog post based on the podcast episodes–which is normally what I do for podcast episodes–we’re going to keep things simple and straight forward. Side note for brand-spanking-new bloggers reading this: Please check-out my comprehensive guide to starting a blog in 2019 and beyond. This should be your blueprint for the first year. 1 Month in: The Facts for Traveling Tanya. Experience: None before this blog, 1 month as of the time of podcast recording. Big Goal(s): To EXIST a year from now, cultivate a tribe to help, an eye for monetization in some form. You simply don’t have the data to make this information useful, and seeing 5 visits a day is not going to bring any joy after week 1. New Blogger Takeaway: Please DO install the Google Analytics (and FB ad) pixel on your site–then forget about it! Here’s a nice tutorial on how to set-up your pixel. Keep it as simple as humanly possible! A plugin for share buttons: https://sumo.com/ maybe–else just search for a social sharing plugin and pick one. The trick is to NOT waste time right now. Don’t think you have to learn everything overnight. …plus, ya know–you don’t have traffic (which you’ll need for optins). In short, write out 1-2 small paragraphs on WHY they should join. Specifically, read this post on the WHAT-WHY-WHAT formula–then do that. Hi! I’m Tanya, and I help busy adults find the time and money to travel the way they dream of! 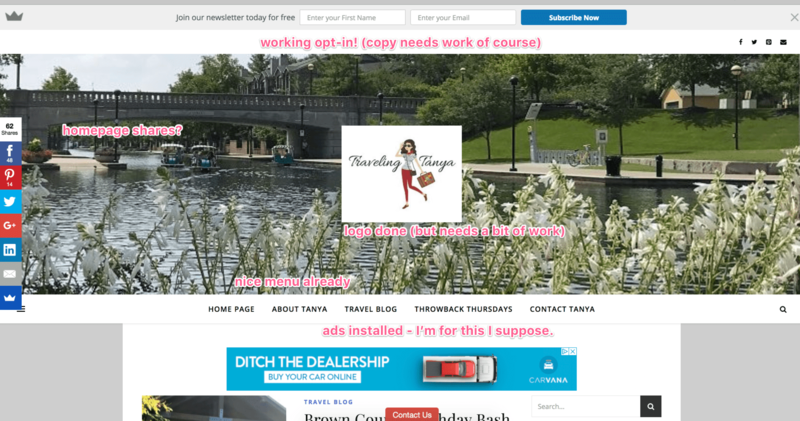 After exactly one month with a brand-new site–Tanya’s blog is looking great! Also, she already has posts up. Sweet! I’d call this a winning month 1, and a great springboard to jump off from. 1 – Fight to produce “good” content–consistently. This is priority #1. It’ll take a long time to figure out what “good” is for her writing skills–and also her audience, but it’s what she should focus on for the 1st 3 months. 2 – Ignore tech stuff for 3 months. She already has the site set-up w/ some plugins, and should not concern herself with anything further at this time–at all. 3 – Go BROAD on her marketing channels. As in, a new blogger should probably experiment across all the big channels, and post everywhere to begin with. After time and analysis–Tanya will probably be able to figure out exactly where she is getting the highest ROI for her time spent marketing–and then focus almost exclusively on those channels. Monetizing a blog is 100x easier with a built-in audience–specifically a loyal and trusting audience. Courses like EBA, 10K Subs, Blogger U, etc–and promote the “get to 1,000 subscribers then test products) formula–and I’m no different. Build tribes. Monetization is a byproduct of that. The idea of starting a blog is often intoxicating–it seems like so much fun, and often seems sooo easy at first! The blog growth vs. time spent spectrum. How do deal with? Google Analytics – What good is it? How do I use it? 1 Key to conquering the “marriage phase” of publishing. Publish less, but publish better. Publishing blog content consistently is key to growth–but not at the expense of stress, unhappiness, a feeling of “the grind” leading to burnout, etc. There are different ways to “publish” consistently–including revamping old blog posts, introducing different–and quicker–formats, and more. These will help struggling bloggers persist. That’s a nice body of content to work with! My personal recommendation to bloggers in this situation: You shouldn’t feel pressured to keep hitting publish 3x a week. What do you think the difference would be if Tanya continued posting 3x per week–vs 2x per week–over the next 3 months? Instead of a publishing goal–adopt a writing goal. Or a “creation” goal, including videos, podcasts, images, etc. You can use something like this to write better, longer, in-depth posts–or simply get ahead on content. 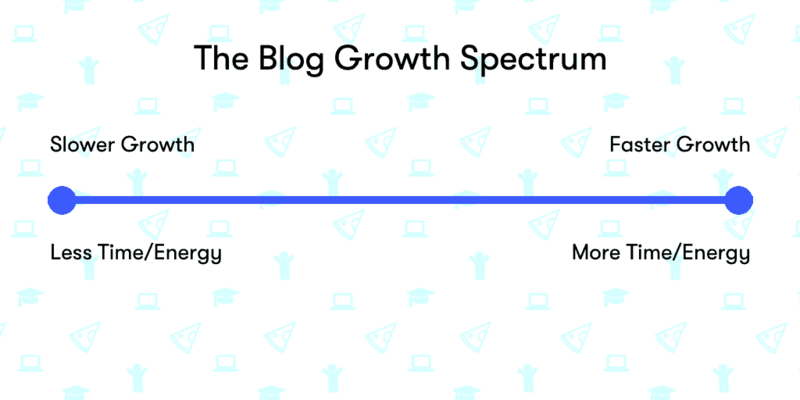 Introducing the blog growth spectrum. At some point you have to make a decision: Where do I want to shoot for on this spectrum? I could probably grow DYEB and BU quicker if I worked more–and sometimes I do want to work more. I’m married with two kids–and frankly, I don’t like working for more than 6-8 hours a day. I’m not willing to give up the hours of 5pm to midnight, which I usually devote to kids, my wife, and to my hobbies. Will I grow slower than if I gave up those hours to work on my blog/business? Where do you want to be on the spectrum? Some bloggers don’t have full-time jobs and don’t need a steady income like you do. Some bloggers have 50-70 hours a week to blog–and do. Some bloggers don’t have 4 kids and 2 jobs. You can’t always control your circumstances–but you can choose where you want to aim for on the blog growth spectrum based on reality. Choose where you want to aim for. Make a decision and be comfortable! When it comes down to how much time you spend working on your blog–embrace your decision and embrace the resulting growth curve you can expect. Blog Tribe–if you’re still reading, can you drop a tip for new bloggers in the comment? What do bloggers in months 0-3 NEED to realize? What should they focus on? I’m really interested to see this case study through the next year. Great idea Pete, and good luck Tanya! I’m also in the first month of my first serious blog. Love the advice on where to focus. I am also popping over to check out Tanya’s blog. Lemme know if you need anything, and good luck! This is awesome. I started my first ever blog around the same time as Tanya and I can’t wait to hear more. Everything else I read or listen to jumps right in assuming people already have subscribers and traffic. This one episode alone had more pertinent information for me (finally) than anything else I’ve come across so far. Oh nice! I’m glad to hear that! Just started listening to this episode this morning. Tonya is great and the content is super helpful. I am a year in to launching my blog and can use all the help I can get! Looking forward to updates on her progress. Love this Pete! I’ve been ramping up my efforts on my blog and learning a lot, going slower than the timeline you’ve set here, and that’s ok with me! Playing the long game is key, my writing is getting much better and I’m grateful for the what I’ve been able to learn from you. Just keep blogging, just keep blogging….